At scruffy dog stock photos we strive to make your stock-image search as fluid and productive as possible. This Navigation page presents you with a few tips for searching the SDSP site to give you the best results for your various projects’ requirements. For the sake of organization, the site is set up by breeds. You can obviously start on the GALLERIES page and choose the breed or type of dog or cat you are searching for. When scrolling through the images, you will quickly get a feel as to how we keyword our images here at SDSP. Keywords can be viewed under each photo. We work tirelessly at our keywords, striving for accurate and exact keywords that lead you to the right images, not pages of false or mediocre hits. To read more about specific keywords, scroll down! If there is a type of image that is suiting your needs, you can refer to the Photo keywords associated with that photo. These keywords are actual links to even more photos that share the same keyword! You can click and view by a single keyword ... or group the keywords you see together by using the Search bar. For more specific results, use the search bar at the top right of the site! With searches, the goal is to narrow down the search results by refining and combining your entered keywords. In the above examples, by adding a dog's color or coat type you will narrow the search even further. Running will obviously garner thousands of results, but being more specific like: running, coming will give you dogs who are running directly to the camera vs. dogs coming to the camera in a walk, or dogs running broadside across the frame. Running, broadside will give you dogs running across the frame. Running, flying or running, airborn will give you dogs who are not only running, but in full flight with four off the floor! For instance: "dried grasses" will garner results where dried grasses are a significant feature of the landscape vs. "grasses" which could be green grasses or dried grasses. Some clients require stock images where a predominant color is featured. At SDSP we have coded these types of images with the added word "COLOR...". So, by searching for "color red" or "color blue" (using the quotation marks), your results will include images where red or blue is the predominant color, not photos of dogs that are red or blue-grey. 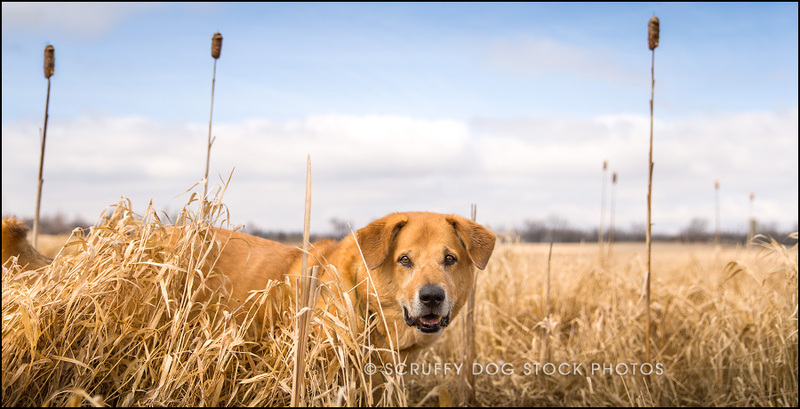 "color brown" will give you results that feature the color brown vs. images that might include a brown dog. 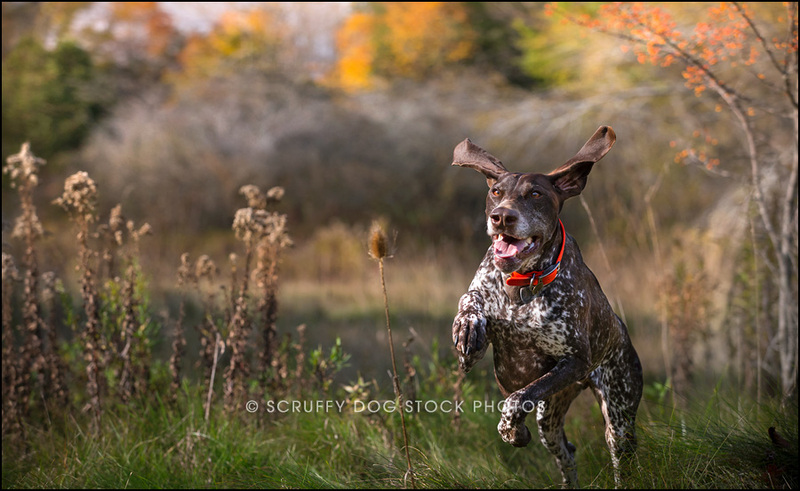 If during your searching through the SDSP portfolio there is a specific dog/model that happens to catch your eye, the best way to see more images of that dog is to actually use that dog's name as a search term! In most cases the model's name (or at least the 'session name') can be found in the Photo ID located under each photo when viewed large. For example, if Jake the Springer Spaniel has caught your eye as the possible mascot for your next campaign, rather than scroll through the entire 'SPANIEL' folder, simply type "jake" in the search bar! A little familiarity with SDSP's keywording hierarchy will certainly aid you in your search for specific types and styles of images, camera angles, and even overall feel of an image, so that you find exactly the images you are seeking. As mentioned, paying attention to the keywords listed as links under every photo is one way to search the portfolio for image that are similar to an image you might be looking at. But to assist you further, here are just a few SDSP keywords that might be significant to the image search for your project. PRIME - this is a keyword placed on certain images where the capture is rare ... most times this designation is given because of the subject's expression and the fact that it is a rare capture and not easily reproduced. Images with a PRIME designation aren't priced any higher, however, please know that they may not be eligible for smaller budgets or discounts. expression - this keyword is applied to images where the animal is obviously giving us a strong expression, but not wanting to limit your search results we don't define specific expressions as these are highly subjective. If you are looking for images that exude expression, try this keyword!